Google Analytics offers a variety of detailed metrics for webmasters to track, calculate and report upon—but how do we know how to use that information to drive ongoing marketing strategy? 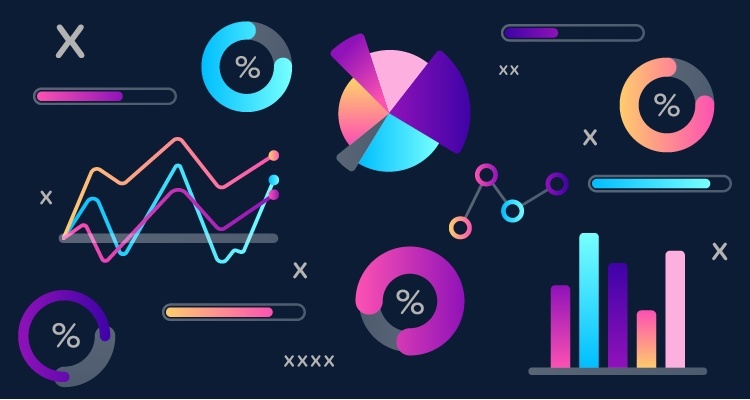 Which metrics matter, what are they telling us, and how can we leverage them to increase traffic, drive leads, and convert customers? How much traffic am I getting? Broken down into users, sessions, and pageviews, your visitor traffic represents the number of people that visited your site during a given time period (i.e., last week, last month, last year). “Users” represent the number of unique visitors who accessed your site. “Sessions” tell you how many times those users visited. And “pageviews” show how much of your site was trafficked by all sessions. To give it more context, if User A visits your site once and views two pages and User B visits your site twice and views three pages, you end up with two users, three sessions, and five pageviews. Users are broken out into two main categories: new and returning visitors. New visitors are the benchmark for growing brand awareness. If your number of repeat visitors is growing but the numbers of new visitors have gone flat, that means you’ve achieved a nice following but not much for audience growth. If it’s the other way around, your site is gaining popularity but your focus should shift to converting users. After assessing your visitor numbers, you need to learn where they came from. Identifying the source of your traffic is critical to understanding how your promotional efforts are paying off. This is where acquisition comes into play. The “acquisition” section of analytics shows how visitors reached you: organic search, PPC, social media, email, direct and referral traffic. This section gives you a snapshot of the top channels sending visitors to your website, along with the associated acquisition, behavior, and conversion details for each one. If you have a blog post that is reaching a large pool of organic traffic from Google search, make sure you add a lead magnet to it to turn more of that traffic into leads. Ever walk into a store, take one look around and then head out the door? You just bounced. Bounce rate refers to the percentage of visits where a user leaves your website without pursuing any further activity. On the site level, bounce rate is a general indicator of user engagement and content quality. Let’s say your average bounce rate is 60%; this means 60% of the people who come to your website leave after only viewing the first page they entered. People are either coming to your site and finding exactly what they need, or they’re leaving to find it somewhere else. Either way, you want to make sure that once your visitors land on a page, they’re compelled to explore the rest of your website. To get the most accurate reading of your site’s bounce rate, you’ll want to view it in conjunction with other engagement metrics, like “pages per visit” and “average session duration.” While there is no hard and fast rule on what makes an acceptable bounce rate, 50% is a healthy baseline. Which pages cause people to leave? The “exit pages” metric can be very informative. Often confused with a “bounce,” an “exit” is the percentage of site exits that occurred from a specified page or set of pages. Simply put, it’s the last page visitors view before leaving. If your goal is to convert more visitors into buyers, it’s important to understand the navigation path visitors took through your site. Your exit rate can guide you to the areas on which your visitors leave your website before converting. Some of your pages may inherently have a high exit rate, like a basic contact or order receipt page. However, if your products or services pages are tracking high exit numbers, you’re likely losing out on revenue. Take a closer look at these pages and consider tweaking the content or call-to-action so your visitors are clear on the next step of their journey through your site. How many visitors am I converting? Arguably the most important metric of them all, your “conversion rate” can have a sizable impact on the profitability of your website. While total conversions are important, your conversion rate is what demonstrates your ability to drive traffic to a desired action (sign-up, purchase, share, etc.). You can determine your conversion rate by calculating the number of people who converted on your website by the number of people who visited. Your conversion rate correlates with the strength of your website. A low conversion rate can mean you’re generating the wrong kind of traffic, your call to action isn’t compelling enough, or you possibly have too many form fields. The key to improving your conversion rate is to test, tweak, and test again. It may feel tedious, but even the smallest of changes can have an enormous impact on your bottom line. Which pages are doing the most work? Your “top ten pages” report determines the kind of content you should focus on as you move forward with growing your site. To generate this report, head to the behavior tab, select content and all content. This will reveal what metrics are responsible for creating your top web pages: visits and pageviews for each page, the average amount of time visitors spend on each page, their respective bounce rates, etc. Once you’ve identified your most popular pages, it’s important to optimize them for leads. Make sure these pages pass the “blink test,” which refers to the few seconds when a visitor lands on your webpage, judges it, and decides if they should stay or go. Test how long these pages take to load and make any necessary adjustments. Plug the URLs into Google’s free Page Speed Testing tool and compress elements like images and video if the page takes longer than 3 seconds to load. Along with a CRM, you’ll want to incorporate lead capture tools to help generate business from the people visiting your site. These are just some of the data points you can use to improve your overall digital marketing strategy. 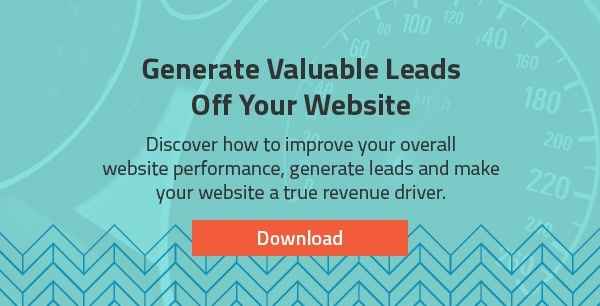 For more insights on how to turn your website into a true lead-generation machine, download our 7 Must-Haves to Get More Leads From Your Website Ebook. Editor's note: This blog was originally posted in January of 2017 and has been updated with fresh content.